Function: Disbursement of MoSMART Grant Funds. 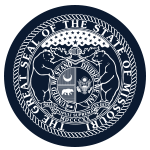 Member Requirements: The Missouri Sheriffs' Association Board of Directors will submit twenty names of sitting sheriffs to the governor. Political Requirements: Yes; no more than three from any one political party.